30,5 x 21,8 cm each diptych. For several years, since 2004, Raymond Depardon has been driving a van across France and using a view camera to take pictures at the roadside. He took photos of panels, windows, roads, trees and buildings; things that are common and unspectacular. He was focussing on one view only, his own, and his determination to capture a trace of everyday France, as close as possible to what it is today. What is today’s significance of Depardon’s work when Google keeps images of nearly all the roads of France on it’s servers, possibly in their billions? Since 2006 Google collects an amount of images that one photographer alone could never make, not even during a lifetime. 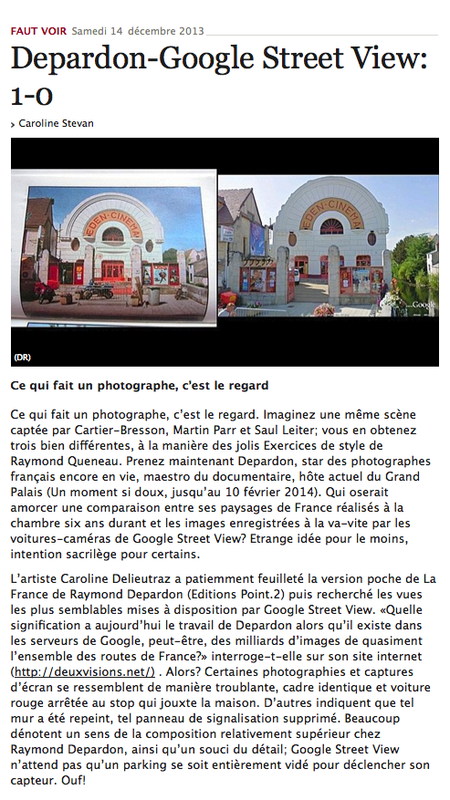 To revisit the route of Google Street-View, on the tracks of Depardon, and comparing images taken with a view camera to screenshots, is bringing into perspective two types of images, two contrasting intentions, two different views of the world. And yet, it cannot be excluded that the two, Depardon’s van and Google’s car, might one day have crossed each other. Raymond Depardon’s photographic experience was the subject of an exhibition (from September 30, 2010 to January 9, 2011 at the Bibliothèque Nationale de France), of a film (“Journal de France” co-directed with Claudine Nougaret and released in 2012) and of two books (published 2010 by Éditions du Seuil, and 2012 in paperback by Point2). For this project I used the paperback edition.